Still technologically challenged ( no computer ) so another quick post with 1 photo! I've just spent about an hour basting this quilt. Possibly my least favourite part of any quilt, as I have to do this on the floor and my knees argue with me. 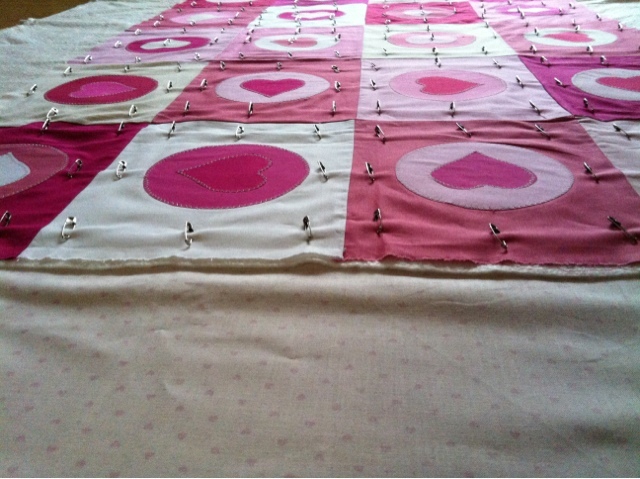 An hour is plenty of time to think and I wondered, should I have planned my pinning based on my quilting? I have tried to and even got the tape measure out to check I wouldn't be pinning where I would stitch but I'm not sure if I have the idea right. So if you have any basting tips they will be gratefully received! I just baste (pin) as well as I can, and remove pins as I come to them. So no stress about designing my pinning! But everyone does it their own way, I suspect, no right or wrong, just how you think!